If the image geolocation and the image coordinate system is not correct, it can lead to processing failure. 1. The image coordinate system is correct. 2. The initial 3D coordinates for each image are correct. 2. In the Image Properties Editor, under the section Image Coordinate System, verify that the correct Datum and Coordinate System is selected. The images lie at the correct position on Earth. 3. If the wrong coordinate system is selected, click Edit... in the Coordinate System under the Image Geolocation section. 4. On the Select Image Coordinate System pop-up, change the coordinate system. For more information about how to change the coordinate system: How to select / change the Image / GCP / Output Coordinate System. 5. On the Image Properties Editor, click OK.
2. 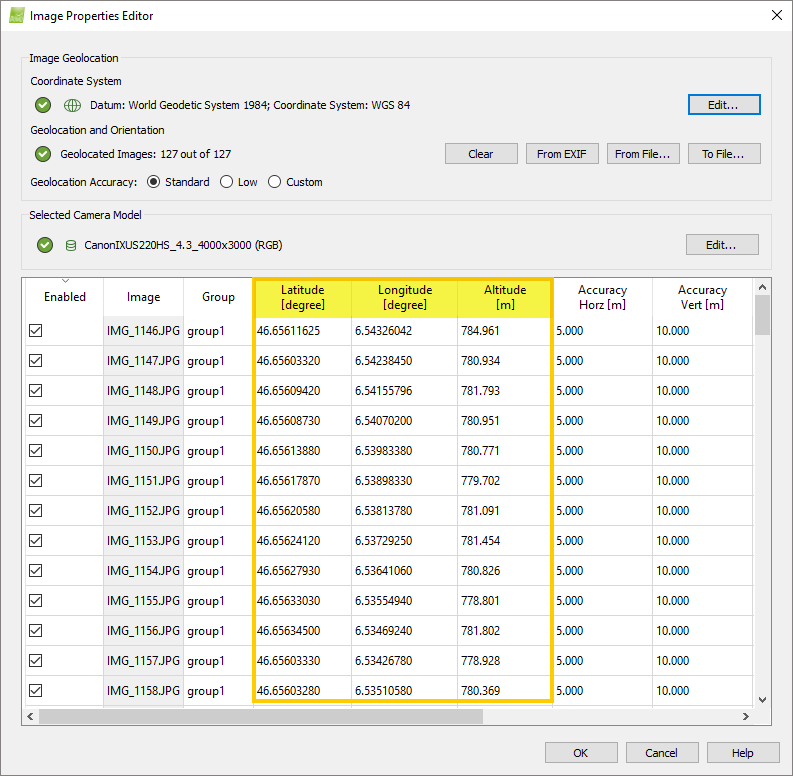 In the Image Properties Editor, use the image table to verify that the Latitude, Longitude, Altitude (or X, Y, Z) coordinates are correct for each image. Each image must have a unique geolocation. If GPS devices are used close to buildings or are not very precise, they can give the same position for multiple images. If all or some images have the same geolocation, it is recommended to remove the image geolocation. Double click on the image dots to display the images. Use the background map to verify that the images lie at the correct place on Earth. If there is a shift in the image position and some images lie on the wrong flight line, it might lead to a matching issue between the images and their position. Check that each image has the correct coordinates.